Looking down, I saw what resembled a mossy carpet, its tight weave separated only by the muddy Paraná River, snaking its way through the vast stretch of jungle. As the plane skimmed over a thick canopy of trees, I noticed my previously unbroken view was now obscured by a giant wall of mist. As if on cue, the rest of the plane erupted in a gaggle of excitement. We were flying past the Iguazú Falls and it was spewing a mountain of spray high into the air, not unlike a smoking volcano. But alas, haze of such epic proportions meant that I didn’t quite get to see the famed waterfalls themselves. We walked out of the modest airport at Puerto Iguazú and into the muggy embrace of the dense rainforest that lay just beyond. The cicadas, clandestine but cacophonous, provided the background score for our 30-minute journey into town. 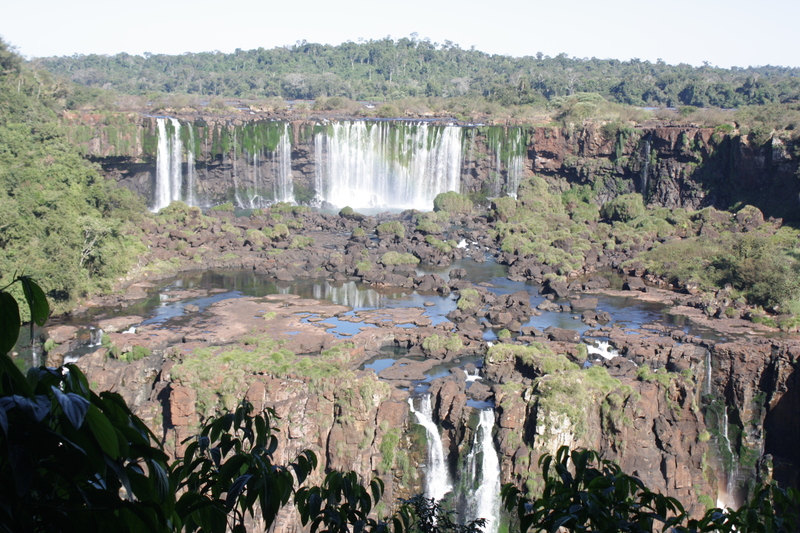 Hugging the tri-border area, with Paraguay on one side and Brazil on the other, the Argentinian town of Puerto Iguazú is enveloped by the surrounding Atlantic rainforest. The centre of town itself is fairly nondescript, the buildings and infrastructure mostly run-down. 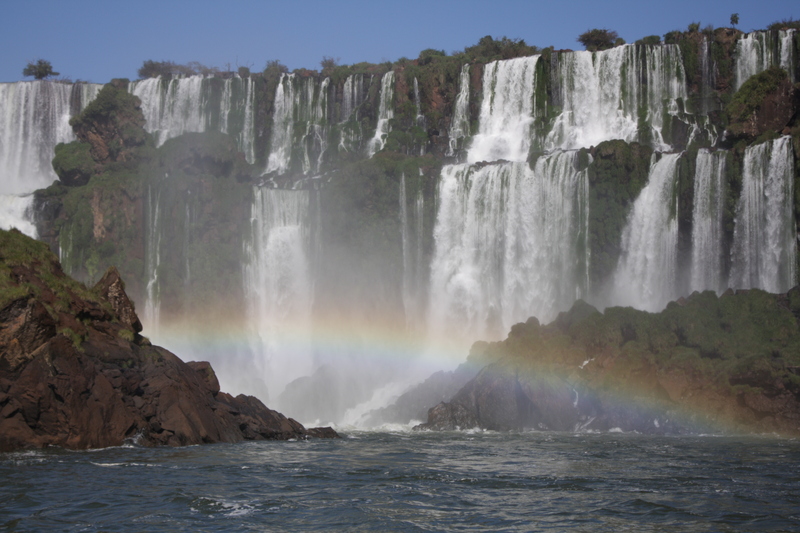 It seemed to only exist as a gateway into the Iguazú National Park – a UNESCO World Heritage site. We opted for lodgings in a little cottage close to amenities and across from the main bus terminal – a decision whose virtues my toddler didn’t hesitate to extol as he sat on the steps watching brightly coloured buses trundle to and from the terminal. A rickety set of stairs led from our bedroom to a cute, little kitchen, cleverly tucked away under the building. A set of French doors led out onto the tiniest of patios. There was something homely about it all. My husband and I parted ways. 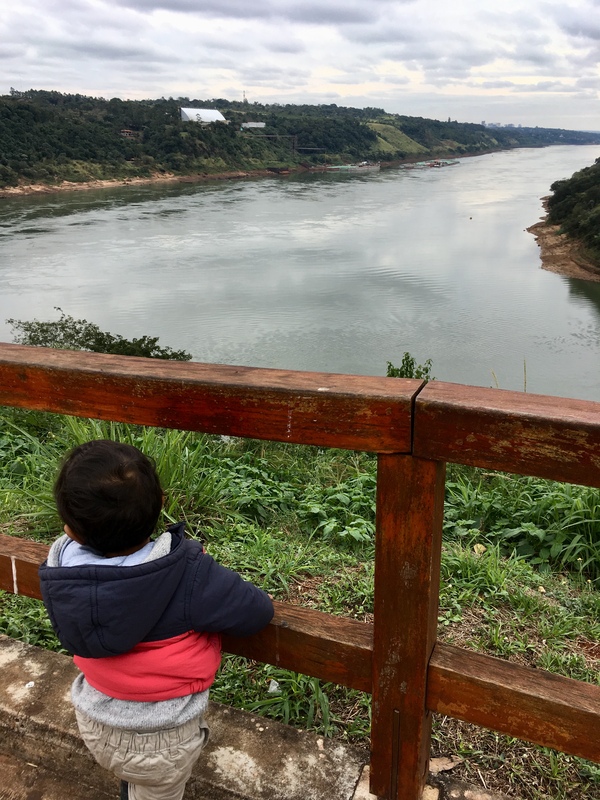 He set off on a day-trip to hike around the falls, which we deemed too strenuous for our young toddler, while my son and I headed off towards the Three Frontiers Landmark – the tri-border area between Argentina, Brazil and Paraguay where the rivers Iguazú and Paraná meet. We traipsed down rutted streets, past market stalls where indigenous Guaraní, resplendent in feathered hats, sold elaborate dreamcatchers and colourful handicrafts. As we approached the Three Frontiers, the neighbourhood became increasingly wooded. 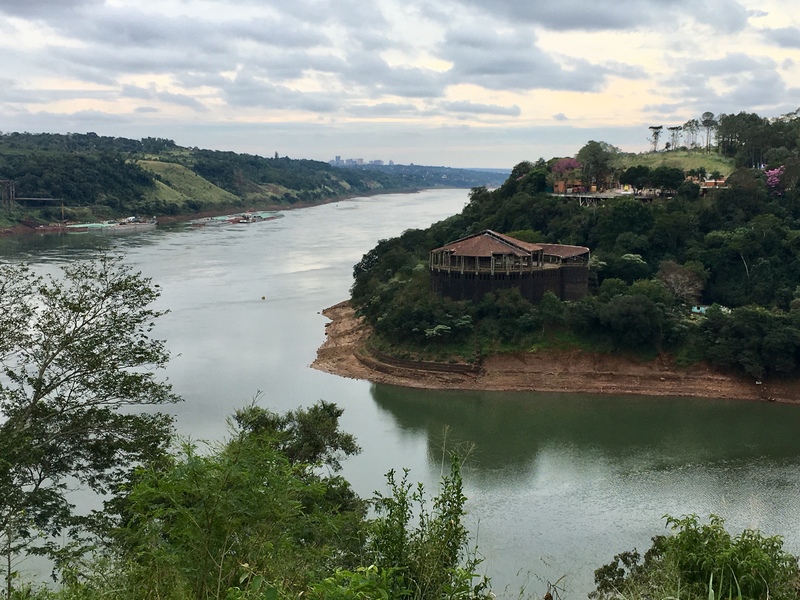 Strolling down a steep hill, we were afforded panoramic views of the rivers, with Brazil and Paraguay beyond. Despite the cover of wilderness, elements on each side seemed to symbolise their respective economic clout. High-rise buildings marked the horizon over the Brazilian side of the border, while raucous tree-fellers lopped down swathes of rainforest on the Paraguayan side. Cargo freighters made slow laps up and down the river, while small canoes darted across, ferrying people and contraband alike. We could’ve spent hours watching the river traffic, but I had other priorities. It was Chand Raat, the eve of Eid-Ul-Fitr. Despite being travel-worn, a sentimental part of me wanted to do something special to celebrate the holy day. Our celebrations come in the guise of epic feasts, and that’s how I found myself scouring the shops in a small town in the middle of a South American rainforest, for ingredients for chicken biriyani. Painstaking conversations in my limited Spanish interspersed with mad gesticulation came to fruition as I returned home with some of the ingredients for my biriyani. When I approached our landlord for help with translating the names of the ingredients, he laughed and said he’d only ever read about some of the spices I needed and had never seen them about town. Upon reaching home, I was faced with yet another challenge – cooking biriyani in the single, modestly sized pot that sat in the mostly bare kitchen cupboard. I should have, perhaps, given up at that point, but my maternal instincts made me persevere. My son would get a taste of Eid, no matter what. What emerged from my kitchen that evening was unlike any biriyani we’d had before, but it was still rich and delicious (or at least I like to think it was) and all three of us savoured both the comforting flavours and the unusual circumstances we found ourselves in. The next day, en route to the Iguazú National Park, I made good use of the 40 minute bus ride to read up on the natural wonder. 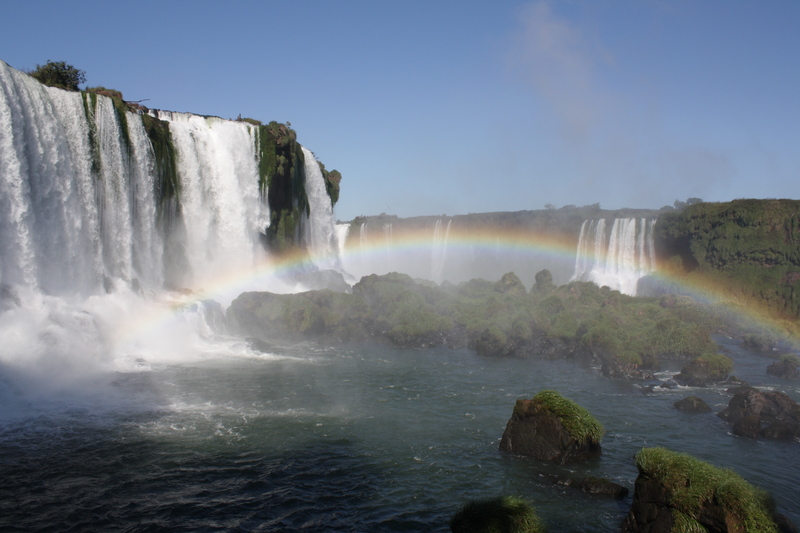 The Iguazú Falls are a system of around 275 waterfalls that extend nearly 3km. The guide book compared it to the Niagra, touting it to be three times as wide, and twice as tall. I was well prepared, having listened, enraptured, to my husband who had returned drenched to the skin from his expedition to the falls, as he pored over the map of the park and highlighted the best routes to take. I knew to take the boat down the river first before embarking on the different walking trails. The boat trip, which gives you a different perspective of the falls, takes you down the sinewy river, through rapids and in a few terrifying instances, under some of the larger falls for a colossal soaking. No amount of raingear will keep you dry, as I ruefully found out, as frigid water seeped down my lower back, despite my waterproof jacket. Thankfully I was warned about this and had a spare change of clothes to change into before plodding off to tackle the many trails that circumvented the falls. However, nothing had prepared me for the sheer scale of the falls themselves. Not even my fly-past the falls themselves. I heard it before I could see it. The roar was deafening. 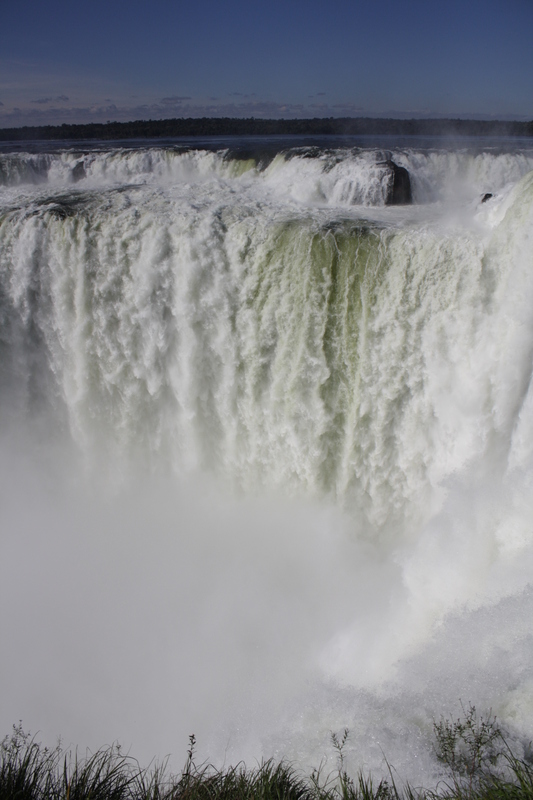 As I stood on the edge of the Devil’s Throat, the tallest cataract, I faced a veritable wall of water, cascading down in twisted, frothy jets. It seemed otherworldly, larger than life. I had never seen anything quite like it. The throngs of jostling tourists melted away as I stood, drenched and utterly spellbound, staring into the cloudy abyss. Well maintained boardwalks wound through lush, subtropical forests, making it easy to navigate. 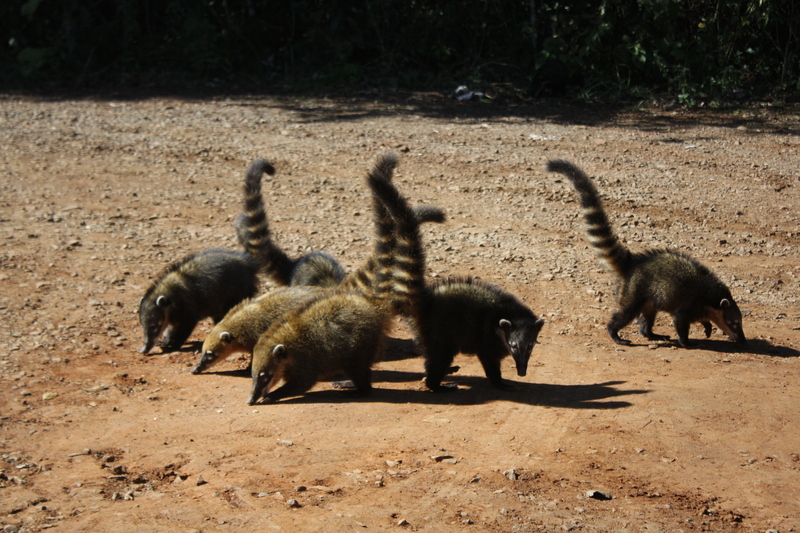 I stopped frequently, to take in the breathtaking scenery as well as to steer clear of coatí (racoon like creatures found in South America) as they harassed fellow travellers in their search for food. The trees rustled overhead and I glimpsed a brightly coloured beak belonging to a toucan. 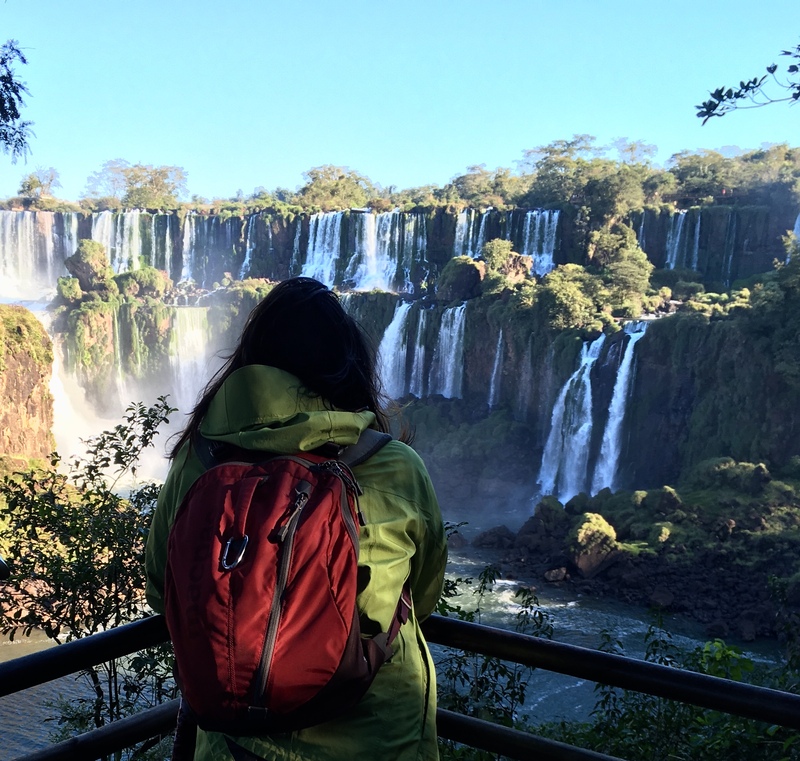 A brief taxi-ride across the bridge, with even shorter formalities at immigration, brought us into Foz do Iguaçu, the Brazilian city that borders the Iguazú Falls. Larger and more cosmopolitan than its Argentinian counterpart, the city is the gateway to the Brazilian side of the falls. With better tourist infrastructure it is easier to get to the Brazilian side of the falls, which offers a panoramic view of the cataracts. We took a hold of this opportunity to introduce our son to the beauty of the Iguazú Falls. Meandering down the trails under the most dazzling rainbows, soaked by the mist and dodging curious coatis, my son remained enamoured most by the red double-decker bus that transported us to and from the falls. Next stop: Ciudad Del Este, Paraguay!